I wanted to learn how to make Chinese salad recipes once I became “hooked” on the Chinese cuisine. Like most cuisines, Asian salads balance the flavors, textures and colors of the local areas. Many of the great tasting ingredients used in cooking entrees, appetizers and all cooking will be also used in making salads. Dressings for the salads often will have soy sauce, sherry, teriyaki, rice vinegar and the great taste of fresh ginger root. Fresh crisp vegetables of the region are used for the base of most salads. This includes lots of Chinese cabbage, green onions and carrots. As you learn how to make Chinese salad recipes you will find the selection varies from region to region slightly. This variation is due to the variety of different ingredients produced in the different areas. Bean sprouts and sprouts of all kinds can be (And are) added to most salads even if they are not in the recipe. Sprouts add flavor, texture, are so healthy and so easy to grow. When I learned how to make Chinese salad recipes I found the basic seasoning in the salads as in other Asian recipes. We still have a light mild flavor in the Northern region, flavorful but still mild in the eastern region, delicate spices of the south and robust and spicy flavors (mainly in the dressing) from the west. I also saw a similarity with other Chinese cooking when learning how to make Chinese salad recipes. Meats and poultry are often served in the salads or on top. Like the entrees, snacks and other recipes, the same seafood, poultry and meats are used in the salads for each region. Lots of fish and seafood is used atop salads and in the dressings of the eastern region of China. You will find chicken is included in salads throughout China as it is here in the United States. Many salad recipes of the southern region will use rice as a base. These salads might be sweet or savory in flavor. Learn how to make Chinese salad recipes using a spicy peanut dressing. Place chicken and following 6 ingredients in medium saucepan. Bring mixture to a boil; reduce heat and simmer until chicken is done about 20 minutes. Remove chicken and cool; save broth for soup. Remove skin from chicken; pull meat from bones and pull in shreds. 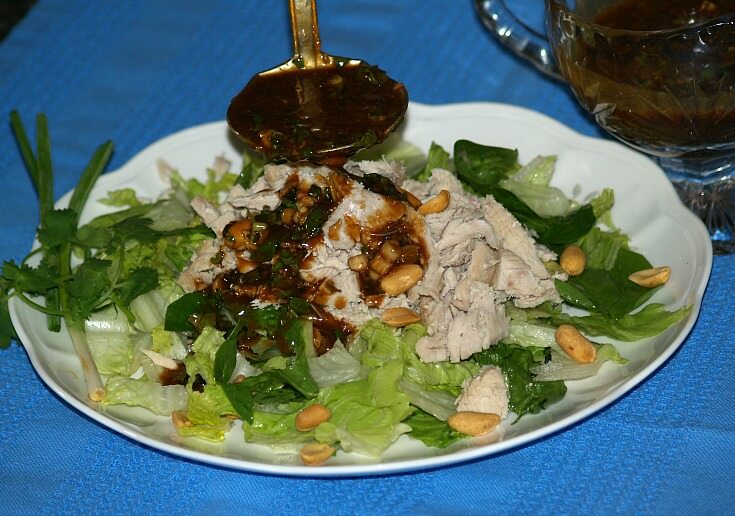 TO SERVE line plates with lettuce; pile chicken on top and drizzle with peanut dressing. GARNISH with fresh cilantro, chopped green onions or peanuts. NOTE: This is suppose to be for 4 servings but for me it is enough for one serving. I multiplied the recipe 4x. TO MAKE DRESSING cream together peanut butter and salad oil; stir in soy sauce, vinegar and sugar. Blend in sesame oil, cayenne, green onion and cilantro. Learn how to make Chinese salad recipes with shrimp and enoki mushrooms. Mix together spinach, cabbage, shrimp, mushrooms, almonds, bell pepper and onion. Combine in a tight covered container the remaining ingredients. Shake well and pour over salad mixture; toss to coat. When I learned how to make Chinese salad recipes I found fresh cilantro to be a valuable ingredient. Combine cilantro, chilies, garlic, brown sugar, fish sauce, white pepper and lemon juice in blender. Process mixture until sugar is dissolved; set aside. Grill or broil the steak to desired doneness; transfer to cutting board and cut thinly across the grain. Transfer meat (and juices) to a bowl; add remaining salad ingredients (Not lettuce) and toss to mix. Line plates or a platter with the Romaine or lettuce. Add the dressing to the meat mixture and toss to mix well. Place meat mixture on top of lettuce leaves; serves 4 to 6. I learned how to make Chinese salad recipes using crisp cucumbers, crisp vegetables and the unique flavor of gomashio. *WHAT IS GOMASHIO? This is a dry condiment, a blend of black sesame seeds and salt. The UNhulled sesame seeds are toasted and mixed with salt. Sometimes sugar may be mixed in commercially made brands. Look for it in Chinese food specialty shops. Place cucumber slices in a bowl adding enough water to cover; stir in salt. Cover and marinate in the refrigerator at least 3 hours; drain, rinse and pat dry. Combine cucumbers, cabbage and next 3 ingredients; toss to mix. Combine in a tight fitting container the vinegar, sugar, gomashio and seasoned salt; shake to blend. Pour dressing over salad and toss; serve immediately. Since I learned how to make Chinese salad recipes I have been happy to use my favorite “cashew” nuts in many. Combine in a large bowl all the ingredients except the oranges and lettuce; mix well. Add oranges and gently fold in. Line plates with lettuce; top with scoops of the chicken mixture. I often add sesame oil to many salads (Even when not in the recipe) since I learned how to make Chinese salad recipes. Separate the broccoli into the “flower” part and the “stem” part. Cut the flower part into small “bite” size clusters. Peel the tough skin off the stem; quarter the stem lengthwise. Cut the “quartered” stems in a slant into 2 inch pieces. Bring the water, vegetable oil and 1 tablespoon of salt to a rapid boil in a large pot. Add all the broccoli to the pot; drain, rinse in cold water, drain again thoroughly. Place well drained broccoli in a shallow dish; make sauce. TO MAKE SAUCE combine all sauce ingredients in a container with tight fitting lid; shake well. Add water chestnuts to the sauce; pour over the broccoli. Cover salad and refrigerate for several hours. When I learned how to make Chinese salad recipes I found many to include napa cabbage. Combine and toss first 5 ingredients in a large bowl; set aside. Combine vegetable oil and remaining 8 ingredients in another bowl; whisk well. Pour dressing over the cabbage mixture; toss gently. Cover bowl and chill 2 hours; serves 12. Cook pasta according to the package directions; drain in colander. Rinse pasta under fresh cold water; drain thoroughly and set aside. In a large salad bowl combine teriyaki, lemon juice, oil, ginger and red pepper. Briskly; whisk dressing to blend; add pasta, crab, cabbage, carrots, onion and cilantro. Toss salad gently to mix and coat; serves 4. Combine water and 2 tablespoons soy sauce in a medium saucepan; bring to a boil. Stir in rice; cover, reduce heat and simmer 20 minutes until water is absorbed. Remove pan from heat; cool in pan. Drain shrimp thoroughly; remove and reserve ½ cup of the shrimp. Chopped remaining shrimp; combine with carrot, peas, green onion and ginger in a large bowl. 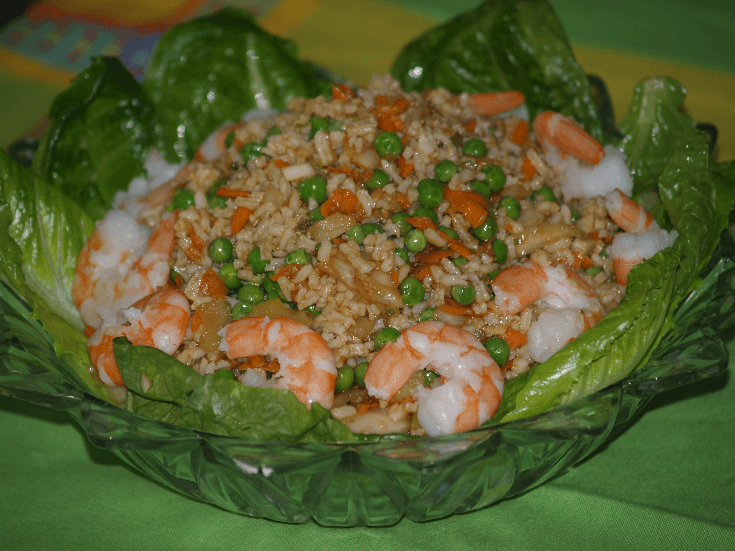 Fluff the rice with a fork; fold rice into the shrimp mixture, cover and refrigerate until cold. Measure the vinegar, sugar, remaining 1 tablespoon soy sauce, sesame seed and 2 teaspoons water. Place mixture in a jar with screw top; cover and shake until sugar dissolves. Pour mixture over the cold rice mixture; toss to coat all ingredients. Line plates with lettuce leaves; spoon rice salad on lettuce. Sprinkle remaining shrimp on top of rice mixture; garnish if desired. Learn how to make Chinese salad recipes with daikon radishes. Combine in a covered container vinegar, oil, soy sauce, ginger root, sesame oil and salt. Combine daikon radishes, mushrooms and onions in a large bowl. Shake the liquid in container until well blended; pour over the radish mixture. Toss mixture in bowl to cover and coat; cover tightly and chill for 2 hours. Serve salad on lettuce leaves; sprinkle top with sesame seeds.